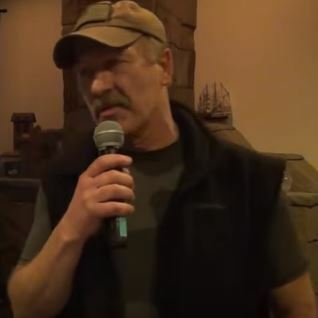 Spokane Valley, Wash. — In a recently released video Dan Hansen, who serves as the Commander of the 63rd Battalion Lightfoot Militia, stated that he is “very, very, very … concerned about Ozzie Knezovich”. “Because of the position that I’m in, as the Commander of the 63rd, as a militia person, as you well know, we get hammered, day in and day out, in the news. Both locally, and across the nation — as a militia. We have a good standing, not only locally, but across the nation. We have an outstanding name. And we have a good relationship with alphabet soup — federal, FBI, DEA, anything that has to do with firearms — we have a good rapport with them. And that rapport is important, not only for us as militia, but for you. But what I want to explain to you tonight, is this: I have been in meeting after meeting, trying to get things resolved with Burns, Oregon. Two weeks straight, no work, nothing but Burns, Oregon. Federal agencies coming talking to me constantly, because they know they have an open door with me. Trying to get a hold on what they’re thinking, in order to get some sort of resolve to it. They don’t get it. They just flat out don’t get it. They understand, to some extent, but they don’t get it. Ladies and gentlemen, I’m telling you: we have a major problem. We have a huge responsibility here — and that’s where, again, the Tea Party is so important, and you need to have more family and friends here. Because, we have got to change the hearts and minds of people through elections. Period. Weapons will do it, but I tell you what — there’s going to be a lot of bloodshed. That’s not the initial way to go. It should be the absolute last resort. And I need you to know, that as the commander of the 63rd, that has always been my philosophy. And, just like the beautiful young lady tht was up here speaking, the Holy Spirit leads my way of thinking. But tonight, what’s important for you to know — and my militia members don’t even know at this point — is that, what I just shared with you: if you do not perform, as the law enforcement expects you to perform, you could very well be in the same position as LaVoy Finicum. So, you need to make your choices. If you carry, if they know that you carry a weapon, you will be put on alert to the law enforcement that you are carrying a weapon, and you will be instructed basically the same way as LaVoy Finnicum — so, you must perform. So, the warning tonight is: you either perform, if you step out of line, you very well could be shot. That’s plain and simple, it’s exactly what they said to me, it’s exactly what they want me to get back to anybody in the militia, is exactly what’s going to happen. So, what does that mean to each and every one of you? How many of you have concealed weapons permits? [looks around the room for a show of hands] A good many, majority. Just be concerned that that’s going to happen. I just want to let you know what the temperature gauge was, it’s not good, I was hoping for better, I’m still working with the alphabet soup and others in order to try to get a better understanding of what we are, who we are, and that they need to stay on task with the Constitution. And constant reminder of the Constitution, because I guarantee you — this Communist regime that is moving forward that wants to eliminate what was up here on the movie earlier, wants to eliminate that old piece of paper. God Bless you all, and just keep us in prayer, please. 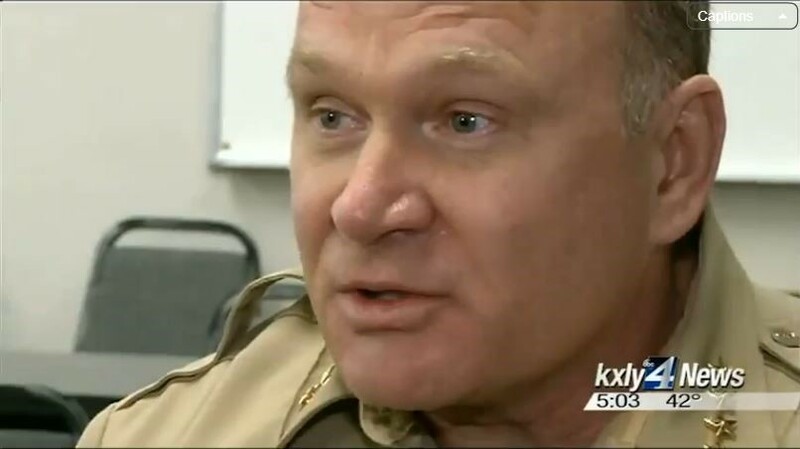 While that standoff in Oregon has ended some, like Sheriff Ozzie Knezovich, believe the issue is far from over, that its bound to happen again, possibly right here in Spokane County. Knezovich says pretty plainly that there are people out there who believe they’re above the law. He believes that you can have your own interpretation of the Constitution as long as you obey the rules. He points out that just last spring, Spokane almost had a similar situation to the one in Oregon, when a group of gun rights activitists flooded the federal courthouse plaza to protest a ban on weapons on the premises. The group carried guns and disregarded a court order to stay off the grounds. While this was a peaceful rally and no one was hurt, Knezovich says that others in the country have ended badly. “The sad thing is, the law abiding gun owners in this community have made one thing very clear to me, whenever I’ve run into them, whenever I talk at their events, ‘Sheriff, will you please tell these people to stop, they’re making us all look bad,'” he said. Knezovich added that it’s very hard to have a productive conversation about the Constitution staring down at the business end of a gun.